Do you need to plug in All The Things? If you’re a gadget addict or an incurable tinkerer, you’ll want to keep all your tools charged up. Here are the accessories you want to deliver that juice. 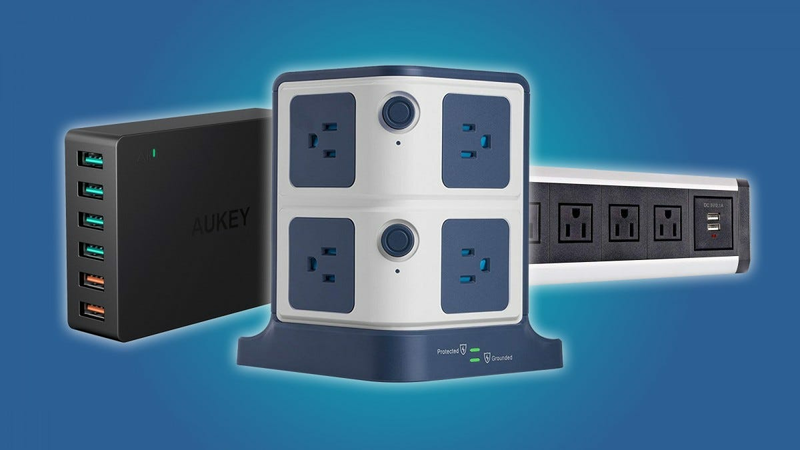 You probably have a standard surge protector behind your desk, but these add-ons will let you plug in and unplug laptops, tablets, phones, and anything else that needs either constant or periodic charging much more conveniently. Some of it’s even designed to complement a standard desk or work table. Any one of them will make it easier to get power to your various gadgets. 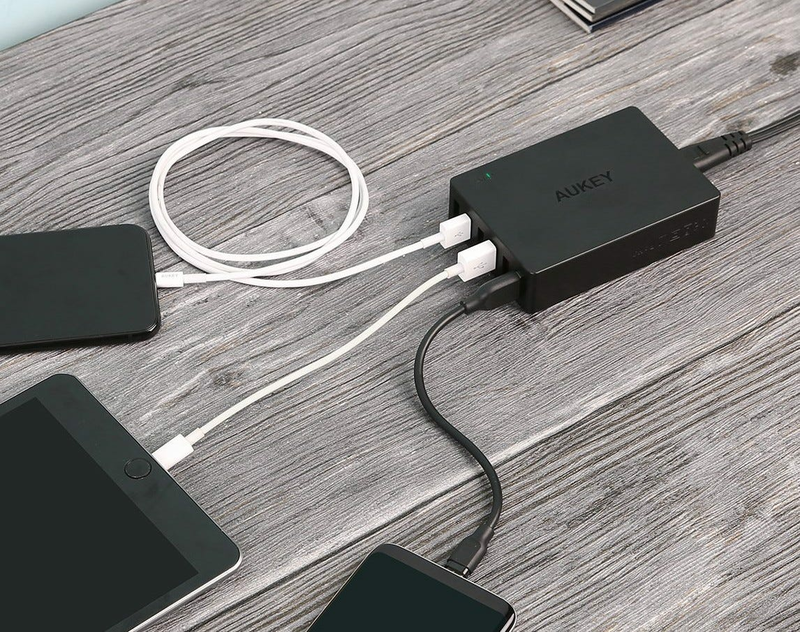 If most of the things in your tech arsenal need nothing more than a USB port to keep charged, then this Aukey multi-charger is all you need. In addition to four standard ports packing 5 volts 2.4 amps of power, the two bottom ports are both certified for Qualcomm’s Fast Charging 3.0 standard, boosting output to 12 volts and up to three amps. Don’t worry—it’s smart enough not to supply too much power if your device can’t take it. All this in a package about the size of a deck of cards, ideal for space-starved desktops (or easy mounting underneath with a bit of heavy-duty velcro). For a one-stop shop with all your phone and tablet charging needs, just add cables. You should already have a reliable surge protector for your expensive electronics. But if you want an easy-to-reach set of outlets for charging laptops and tablets (which you can always plug into a surge protector anyway), check out this handy little extension. It includes four separate US-standard wall outlets, two USB charging ports, and it clamps onto the back or side of your desk for a semi-permanent mount that won’t be knocked back into your nest of cables. The design is simple and effective with a standard tension clamp that can attach to any desk or table up to about an inch thick. An upgraded version is available with an Ethernet port, but most users won’t have any need for that anymore. If your desk has grommet holes in the sides or center and you’re not using them, you can put that hole to a better use. 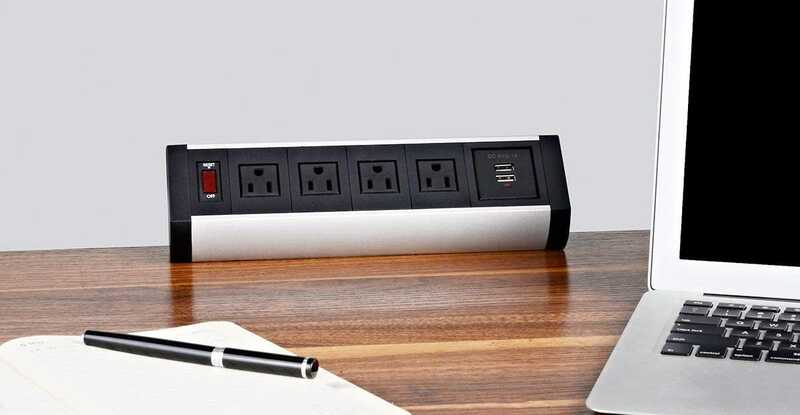 This ingenious design hides a retractable set of US plugs and a pair of USB ports in a pop-up power strip. Leave it hidden and flush with the desktop most of the time, then pull the tab and reveal those extra power outlets when you need them. 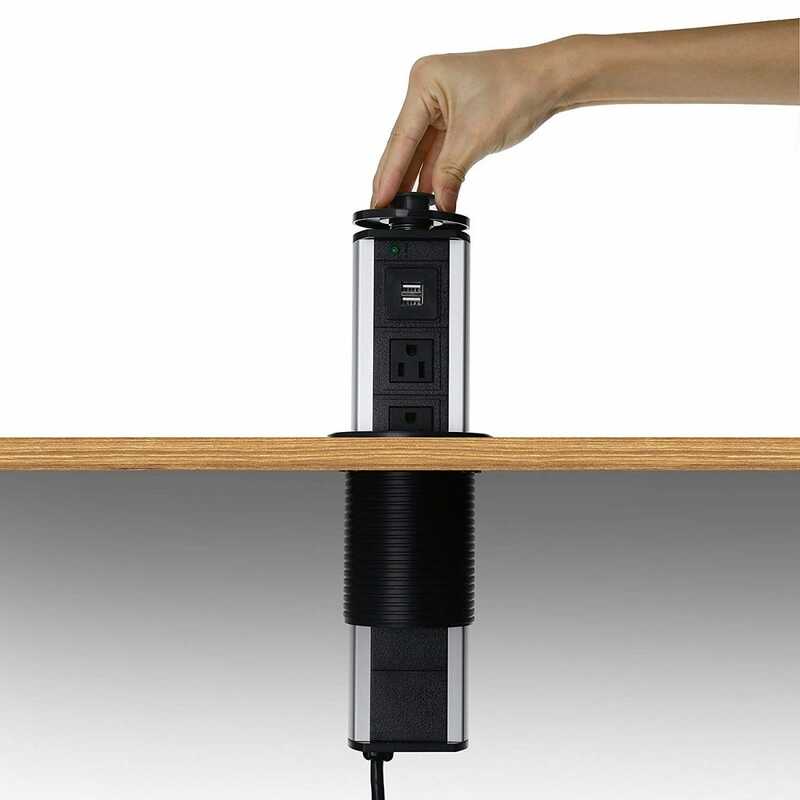 The mechanism locks in place at the top and bottom of the action, and the power cord snakes down beneath and behind your desk to plug into the wall or surge protector. Cheaper models feature just three or four outlets if you don’t need the full five, and there’s also an upgraded model that raises automatically with a spring. For those who want to display their various gadgets in fashionable style (or maybe just keep them neatly organized), a combined charger-stand solution is best. This Unitek design is more flexible than most, thanks to dividers that can be moved in or out to accommodate seven phones or tablets with different widths. It’s no slouch in terms of charging, either: two of its six standard USB ports are compatible with Quick Charge 3.0, and a dedicated USB-C port can handle newer devices (though do note that it’s not powerful enough for USB-C laptops). This beefy station has enough combined wattage to charge seven full-sized tablets at once. If all you need to do is charge just a crap-ton of gadgets at once, this charging tower will do the trick. It includes no less than eight full-power outlets with an integrated surge protector, plus six 2.4-amp USB ports to boot. The system smartly divides the outlets to account for oversized plugs, and at least half of its plugs are available in any given cardinal direction. 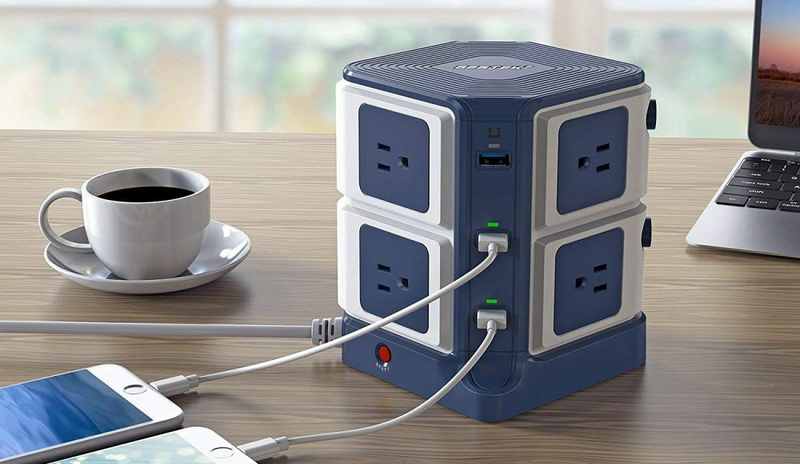 With 1500 joules of surge protection you’d be hard-pressed to overload this thing with anything except massive power tools. Want one with a trick up its sleeve? This upgraded model in the same shell comes with a wireless charging pad on top. 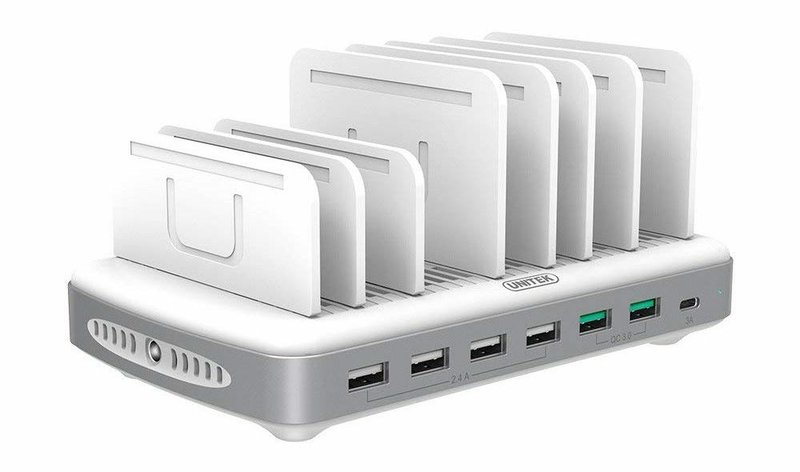 I’ve owned one of these Belkin gadgets for the better part of a decade, and I love it. The three-outlet surge protector is an excellent travel companion, flexibly reaching any standard outlet thanks to its rotating head. It’ll also make you the most popular laptop user in the crowded airport terminal. With two USB power outlets built in it’s also handy for working around your house anywhere you find that you need more than your usual assortment of gadgets. With 918 joules of surge protection and an LED indicator, it’s surprisingly capable for how compact it is. Make sure you grab the newer 2.1-amp version—it’s worth the extra dollar.